Our Bala Stylus Pen features wide body shape with unique mid-barrel retraction and allows adding logo and message to Promote your Brand. The Carrita retractable ballpoint pen features a sleek classic design and smooth rubber grip for writing ease. Our Crescendo Pen features sleek, wide design barrel and modern accents. Add your Brand logo to Promote your Brand! Our Fiji Chrome Stylus features brushed silver barrels with chrome accents, Customizable with your logo for Brand Recognition. Our Guillox 9 Ballpoint Pen features three high gloss enamel color options, Customizable with your logo for Brand Recognition. 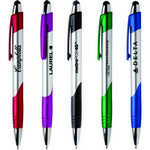 The Javalina Platinum Pen features various bright glossy color options, Customizable with your logo for Brand Recognition. Our Junior Pen features 24 hold grip design for writing comfort and allows adding brand logo and message for corporate swag. 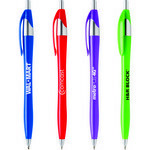 The Turri pen features chrome accents and sculpted grip and clip, Customizable with your brand logo. The Mateo Stylus Pen features shimmering metallic body with accents, Customizable with your logo for Brand Recognition.